Published: Dec 1, 2014 to ? 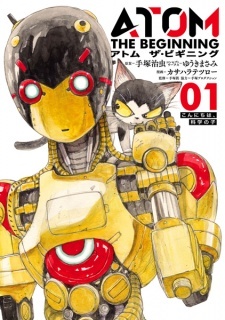 The manga will tell the story of what happens up until the birth of Astro Boy. The series has been published in Spanish by Milky Way Ediciones since April 27, 2017. I love this manga that is written in perfect Osamu Tezuka's style. The evolution of the protagonist, 'atom' aka 'six' is really very very interesting. I like the art style, the story and the fact that, in the volumes, you can find amazing color pages. Until now this manga has been translated in Chinese, French, Italian and Spanish. Six is a robot with a great humanity and you will love him more and more by reading the story. The two young doctors are great, but the more interesting charas of the story is Ran, Umataro's little sister, sho is a very shy and cute girl with a great love for robots. She's also a great robotic genius and could become more intelligent than his big brother. She has a big crush on Six, because he saved her life and, how can say, Ran and six are connected. In the manga the author give us more information about robots, but I'de to have also some information about the humans of the story.